In Part 2 of the British installment of our series, Military Watches of the World, we are going to examine the wristwatches issued to HM’s forces from the post-WWII period through the Vietnam War era. One of the most iconic of perhaps all issued military watches is the 6B/346, commonly referred to as the Mk. 11 and produced by Jaeger LeCoultre and International Watch Company. This spec was designed in the immediate aftermath of the War as a new, highly accurate navigation watch for issue to pilots by the MoD, and was in use from 1948 through 1981—quite a run for an issued timepiece. These watches had stainless steel cases measuring 35-36 millimeters with long lugs and (generally) fixed strap bars, antimagnetic Faraday cages, and matte black iron dials. The dials have Arabic numerals from one to 12 (later, the 12 became a triangle) and minute markings in white, with the exception of the cardinal, lumed graduations at three, six, and nine. Movements were specified to be central-second, 12-ligne Swiss calibers with 36-hour power reserves and a daily rate variation of no more than +/- 4 seconds. Cases were expected to be waterproof to 20 feet and acrylic crystals were held together via a retaining screw to prevent detachment during decompression. Early versions featured radium lume, with later versions featuring tritium denoted with a circle “T” on the dial. JLC mk. 11 variants. Images courtesy of Analog Shift. Both versions of the Mk. 11 were eventually issued to the RAF, FAA (Fleet Air Arm), RAAF (Royal Australian Air Force), RNZAF (Royal New Zealand Air Force), and several other units. The JLC variants utilized the Cal. 488/SBr, which was a chronometer-grade movement that later saw use as the basis of the 1958 JLC Chronométre Geophysique. The IWC variants utilized the famous Cal. 89, widely lauded as one of the best three-hander movements produced by any Swiss firm, and it was subsequently used in numerous civilian dress watches. The JLC version was eventually discontinued in 1953 and later decommissioned due to its inadequate shock protection, and IWC, realizing that their original Cal. 89s were returning often for service for the same reason, subsequently updated their newer 89s with Incabloc shock protection. These IWCs were finally decommissioned in 1981. For a comprehensive article on the Mk. 11, check out our past coverage here. In the early 1950s, the MOD drew up the 6B/542 spec, which called for a 36mm, stainless steel-cased, manually-wound watch with a matte black military-type dial with white numerals. Omega produced this watch in 1953, and examples are generally referred to either as the “Omega 53,” or as the “Thin Arrow” or “Fat Arrow” (originally, dials were produced with radium lume and a thin broad arrow, but these watches were later recalled and swapped for tritium dials on which a thicker broad arrow was painted). Occasionally, tritium dials are seen with thin arrows, which appear to be a rarer variant of the watch, as Omega was likely using spare dials that had not yet been lumed. These watches featured the Omega caliber 283 complete with a Faraday cage for anti-magnetic protection. Image courtesy of Analog Shift. A similar model was also produced by Hamilton and Smiths. Early Hamilton versions featured the non-hacking 75s movement, while the later versions featured a hacking S75S movement. The watch went through several iterations, including a later version with “G.S.” (General Service) on the dial, which was evidently issued to non-military government personnel. The Smiths variant, generally produced under the “Smiths DeLuxe” line and also referred to as the “General Service” watch, featured the Smiths in-house cal. 0434E or 27CS (center seconds) movement (watches are stamped 27CS on the movement, but the Smiths catalog referred to them as the 0434E, making for some confusion). Another Smiths military watch, not to be confused with the 6B/542 issue, is the W10, and it has the distinction of being the last serially-produced wristwatch made entirely in England for the MoD in the late 1960s/early 1970s (see our past in-depth coverage here). This 35-millimeter watch featured the Smiths cal. 60466E, an impressive hacking, 17-jewel in-house caliber with frosted gilding and an anti-magnetic dust cover inspired by the JLC movement from the Mk. 11. These pieces were issued to various service branches, with the RAF versions featuring “6B” in the case back markings, a general designation for RAF flight equipment. Backtracking a moment to the 1950s, an interesting type of chronograph was developed for issue by the MOD and manufactured by Lemania, Breitling, and Rodania. These chronographs, which featured a single pusher for start, stop, and reset duties (and referred to colloquially as “mono-pushers”) were issued to navigators in the RAF and later to sailors and submariners in the Royal Navy. Naval versions, marked 0552/920-3305 and produced between 1945 and 1976, featured the manually-wound 17-jewel Lemania cal. 15 CHT and radium dials (later swapped for tritium in the 1960s) in 38.5-millimeter stainless steel cases. Some versions can also be found with “H.S.” on the case back, indicating issue to the Hydrographic Survey department. Note that while examples from Lemania with definitive RAF provenance have been unearthed, more often than not these monopusher chronographs were issued to the Royal Canadian Air Force, and the author has yet to discover a genuine Omega or Rodania example with RAF markings. Another variant on the monopusher chronograph idea is the Lemania 6BB. Featuring a 40-millimeter asymmetric stainless steel case, manually-wound Lemania 2220 movement, Incabloc protection, and tritium dial with two sub-registers, these watches were issued to RAF navigators, and in a non-lumed version to Royal Navy submariners serving on nuclear subs (having your radioactive tritium-lumed watch set off the sub’s leak-detecting equipment tends to get everybody worked up for no good reason). The Lemania 6BB’s asymmetrical case was followed by a whole crop of similarly designed watches manufactured by Hamilton, CWC, Newmark, and Precista (click here for a thorough investigation by our very own Brandon Cripps). These pieces, issued in the late 1970s/early 1980s and manufactured under the 924-3306 standard, all featured 30-minute chronographs based around the Valjoux 7733 movement, stainless steel asymmetric cases, black tritium dials, and spec. markings on the case backs indicating issue to either the Royal Navy, RAF, or RAN (Royal Australian Navy). Omega Seamster 300 Royal Navy. Image courtesy of Analog Shift. Two of the world’s most iconic dive watches, the Omega Seamaster and the Rolex Submariner, also saw issue as military wristwatches. Between 1967 and 1971, the MoD issued Seamaster 300s to both the Royal Navy (0552 designation) and the RAF (W10). These were essentially Seamaster reference 165.024s modified with fixed strap bars, mil-spec hands, screw-down crowns, and circled “Ts” on the dial, indicating the presence of tritium. Other features include a 42mm steel case, twisted lugs, and wide bezels with hash marks for each minute. Though Rolex had supplied the MOD with reference 6538 Submariners beginning in the mid-1950s, these were stock civilian models without special modification. After testing these watches, the MoD returned to Rolex and requested a redesign of the bezel for ease of use while wearing gloves, and fixed strap bars. The watch that incorporated these modifications was referred to as the A/6538, and was supplied to the Royal Navy. A short while later, the reference 5512 was also put into use by the MoD. Mod-refurbished A6538. Image courtesy of Revolution. Toward the end of the 1950s, the MoD recalled the A/6583 and 5512s in rotation and had their radium dials swapped for tritium versions, and when these surface (especially the A/6583s), there is cause for enormous horological merry-marking (cue that scene from Monty Python in which “there was much rejoicing”). In 1972 the MoD decided to replace the Seamaster 300s that had been issued to the SAS (Special Air Service) and SBS (Special Boat Service) with specially modified 5513s, the contemporary Submariner reference. 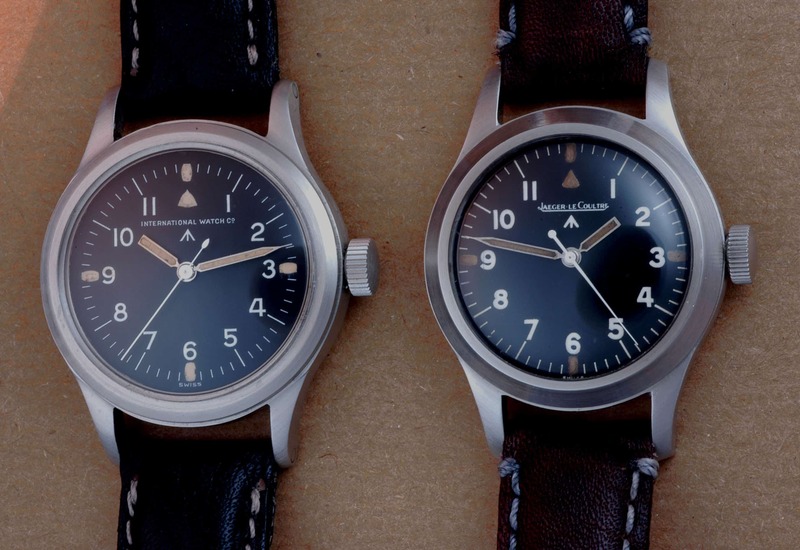 These Subs differed from their civilian brothers with the addition of a circled “T” on the dial, sword hands, full 60-minute gradations on the bezel, and fixed strap bars. Mil-Sub 5513. Image courtesy of Bob’s Watches. Later, toward the late 1970s, Rolex introduced the 5517, a purely military Submariner designation with the aforementioned characteristics (a very small number produced between these two references were double-stamped 5513/5517 and constitute the unicorn-iest of military watch unicorns, considering that only around 1,200 Mil-Subs were made in total). Stay tuned for Part 3 of the Great Britain installment, in which we examine British-issued military watches from the post-Vietnam War era through today.